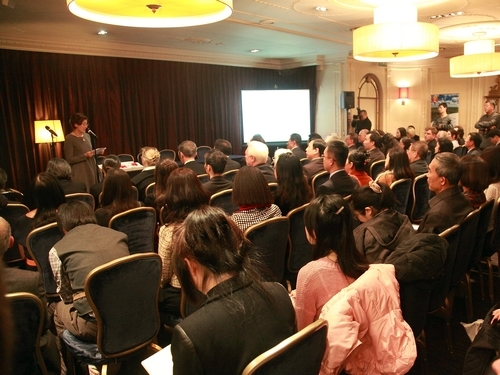 On October 31, 2012, the book launch for the Works of Art By Li Lanqing: Chinese Seals and Calligraphy (English version) was held at Millennium Hotel London Mayfair jointly by the Chinese Embassy and the Organizing Committee of the Exhibition on Contemporary Chinese Seals by Li Lanqing. Chinese Ambassador Liu Xiaoming, Vice Minister of Culture Zhao Shaohua, former Vice Foreign Minister Wang Yingfan and other over 100 guests attended the launch, including the representatives from the Organizing Committee of the Exhibition on Contemporary Chinese Seals by Li Lanqing, the China-funded enterprises and the Chinese community and business, the Chinese press media in Britain, the celebrities and experts in the political, cultural, educational and business fields of Britain, the representatives from the British Museum and British publishing agencies, and the local British media. 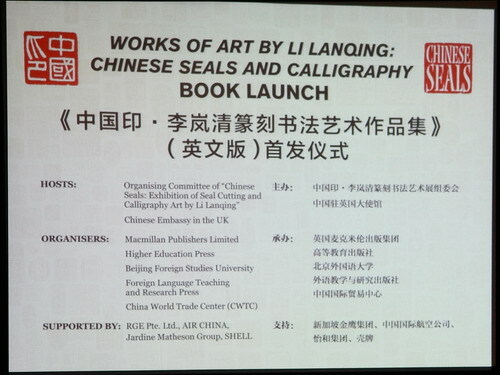 The Works of Art by Li Lanqing: Chinese Seals and Calligraphy (English version) is jointly published by Macmillan Publishing Group in the UK and the Higher Education Press and the Foreign Language Teaching and Research Press in China. It contains 461 seal carving and some calligraphy works of Mr. Li Lanqing, which are divided into five parts: Chinese seal carving, world culture, Chinese culture, contemporary China and the delight of life. The book provides a whole picture of Mr. Li Lanqing’s long experience in seal carving with diverse forms, including seals, poems, calligraphy, painting, pictures and text and leads its readers into the artistic world of seal carving while they are enjoying Mr. Li’s works. The book helps the British readers to understand China’s art of seal carving, history and culture as well as its development and changes since the reform and opening up, and will help to further promote the cultural, artistic and educational exchanges between China and the UK. 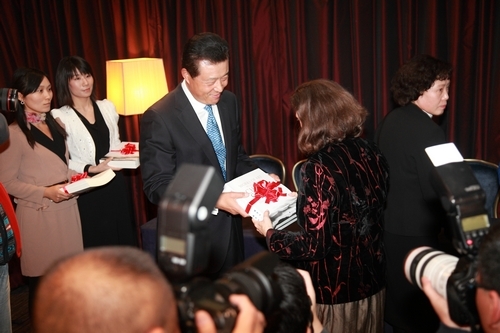 The book launch was presided over by Mr. Cai Jianfeng, President of the Foreign Language Teaching and Research Press. Mr. Simon Allen, CEO of Macmillan Education, Mr. Su Yuheng, President of the Higher Education Press, Ms. Andrea Rose, Visual Arts Director of the British Council, and Mr. Wang Yingfan delivered speeches at the launch. Ambassador Liu Xiaoming, Vice Minister Zhao Shaohua, Mr. Wang Yingfan and Mr. Liao Xiaoqi, Chairman of China World Trade Centre, presented the Works of Art by Li Lanqing: Chinese Seals and Calligraphy to the British guests.